Begin by speaking to the Golem in the Ruins of Uzer. Firstly, head to Shantay Pass south of Al Kharid, and buy some desert equipment if you don't have any already. Go through the pass and head southeast, until you get to a bridge, and then continue east, until you find a Golem among some ruins. Speak with him, and you'll find that he is damaged and he has a task to complete. Use 4 Soft Clays on him, and speak to him again. This letter suggests to go to the Digsite, which is just east of Varrock. Speak to Elissa, who can be found in the north-eastern area of the digsite. She tells you about Varmin's Expedition Notes and that they can be found in the Exam Center Library. Search the bookcases until you find the white book, which gives you some interesting info about the history of Uzer. Now go back to the Curator Haig Halen in the Varrock Museum. 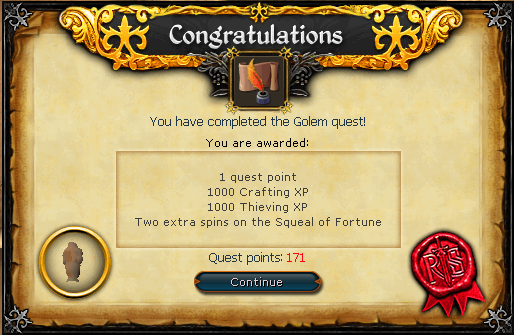 Note: If, for some reason, you happen to still have a Certificate from the Shield of Arrav Quest in your bank, the Curator won't do anything during the quest, so either collect your reward or drop that certificate. Ask him about the Statuette, but he refuses to let you have it. Pickpocket him for the Cabinet Key, go upstairs, and use the key to unlock the Display Case to get the Statuette. Head back to Uzer, but before crossing the bridge in the desert, find the Desert Phoenix, which roams around the river bank west of the Dominion Tower, and take a Phoenix Feather from it. The take-feather action works just like pickpocketing, the Phoenix might get angry and stun you as well as doing 1 damage on you. Before entering the temple near the Golem, pick some Black Mushrooms, that are found just near the stairs. Do not eat them! With a Vial in your backpack, grind them up with your Pestle and Mortar to get a vial of Black Mushroom Ink. Now go downstairs. Once you're downstairs, put the Statuette you "borrowed" from the Varrock Museum in the empty slot in the center of the temple. Now turn the 4 statuettes, so that the 2 on the west side are facing left, and the 2 on the east side are facing right. Check the chatbox when you turn them if you're not sure of their direction. The doors to the portal should now open! Go inside and examine the horned skeleton on your right to learn that the Demon is dead! Awesome! If you want six extra gems (a few extra goodies never did any harm to anyone), use your Hammer and Chisel on the throne in the demonic room. Step out of the Portal, grab the Strange Implement that you can find on your right and head back upstairs to the Golem. 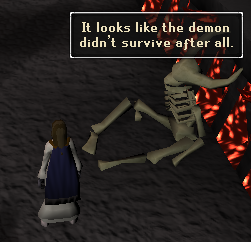 Apparently, the Golem has been programmed and he can not believe that the Demon is dead without his intervention. Dip your Phoenix feather in the Black Mushroom ink, use your now Inked Phoenix Feather on the Papyrus (where you'll scribble "Your task is done"), and then use the Strange Implement (which happens to be a sort of key) on the Golem to open his head. Quickly use the Papyrus on him to update his program and... Quest Complete!